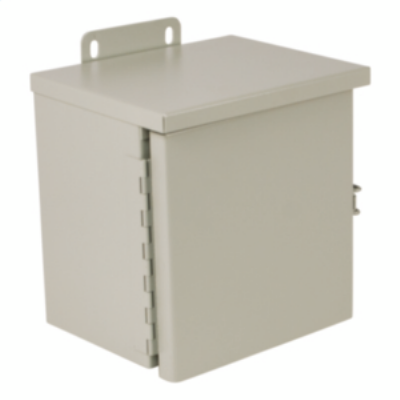 Designed for use as wiring boxes and junction boxes. Provide protection in outdoor installations against rain, sleet, and snow, or indoors against dripping water.Bodies and doors fabricated from 14 gauge carbon steel. Continuous hinge. Hinge is made of galvanized steel with a stainless steel pin. No knockouts. Collar studs provided for mounting optional back panels. External mounting plates, top and bottom of enclosure. Hasp and staple provided for padlocking. Grounding provisions provided.